Summary: Jessica Long started life in Siberia as Tatiana Kirillova; she was adopted by the Long family at the age of 13 months. Born without fibular bones, Jessica underwent surgery shortly after arriving in the U.S. to remove both legs below the knee. She learned to walk with prosthetics, and soon became active in a variety of sports. Swimming eventually won out over the others, and Jessica began competing as a Paralympian. She has participated in Paralympic events in Athens, Beijing, London, and Rio de Janeiro, winning 23 medals to make her the second-most decorated Paralympian of all times. 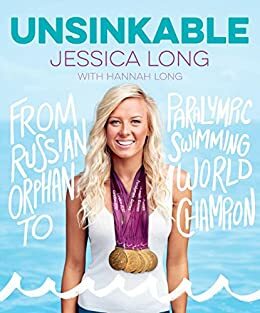 She tells her story as a series of life-changing moments (“The moment I won my first gold”, “The moment I lost my confidence”, etc. ), that cover the highs and lows of her life and athletic career. Jessica has enjoyed working as a model, and the text is illustrated with many photos of her, her family, and her friends. Looking at her Facebook page, it seems as though she is making plans to compete in Tokyo in 2020. 112 pages; grades 5-8. Pros: Jessica tells her story in a chatty, upbeat style that, along with the many photos, will appeal to upper elementary and middle school readers. Even her struggles with anxiety, OCD, and bulimia are covered with a pretty positive spin. Cons: The format of life-changing moments, which were not in exact chronological order, made the story seem a little disjointed. Also, not a con, but a heads-up that Jessica and her family are devout Christians, which is sometimes mentioned in the story, particularly “The moment I found peace”.